Perovskite solar cells – funny name, serious tech. They’re kind of the ‘it’ thing in solar technology right now. Think N’Sync back in 1998 when they all had those terrible haircuts or 1980s Guns N Roses when they all had… those terrible haircuts. Not to be too dramatic, but perovskite cells really could bring a huge change to the solar industry, and by extension our entire electricity infrastructure, forever. Despite being quite a new technology, they’re naturally cheap and easy to make, and are already as efficient as our ubiquitous crystalline silicon panels (the ones on our rooftops). Unlike crystalline silicon panels, however, perovskite solar cells can be attached to both rigid and bendable surfaces, making them more versatile than the hard, heavy panels commonly used today. If they’re so great, why aren’t perovskite solar panels all over the world? As we mentioned, they’re still a brand new technology and, like all technologies, there are still some kinks to work out. In fact, perovskite cells are just one of the many types of solar cells that universities, research groups, and solar manufacturers are playing with. With the goal of a cheaper, more efficient, more versatile panel, scientists are looking at new materials, and new mixes of materials, to construct solar panels. Companies and universities are always tweaking our common silicon panels to increase their efficiency and lower manufacturing costs. Over the last 10 years, research has instead exploded around completely new materials to construct solar cells. Let’s take a look at a few of these promising new developments, then we’ll get into perovskite solar cells: reviewing what they are, their benefits, and their challenges. Universities, government labs, and solar manufacturers are researching, testing, tweaking, and bettering solar technologies quite literally all the time. Each new technology has its own benefits: some are cheaper to produce, others enjoy wider applications (paint-on solar, anyone? ), and others have the promise of a huge jump in efficiency. The University of Texas, Austin is working with a mix of copper, iridium, gallium, and selenide (known as CIGS) that can be dissolved and mixed with a solvent to produce paintable solar cells. The US DOE funds studies at several universities including Princeton, the University of Michigan, and the University of Florida on organic photovoltaics (OPV). OPV is different than other solar cells in that they can be made transparent – perfect for building-integrated solar. Imagine your windows and skylights producing electricity! Research currently focuses around increasing the efficiency (currently at around 11%) and longevity of the product. Thin-film solar cells have been around for a while and are even commercially available (you can buy it online right now and stick them on your metal roof), but they can always get better. There are a few different types of thin-film solar, and they’re pretty cheap and easy to install, but are hampered by low efficiency – around 8% to 15%, compared to a common solar panel’s 18% to 22%. Researchers are constantly seeking to increase the efficiency of these products, with good results so far. Where does perovskite sit among this smorgasbord of technologies? Let’s find out. #2 What are perovskite solar cells? 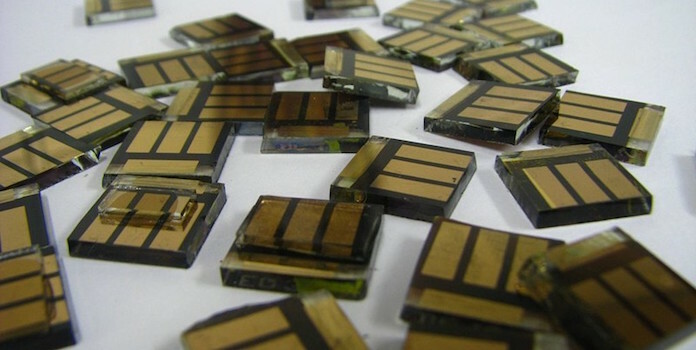 Perovskite solar cells are a type of thin-film cell (like the ones we just mentioned). While scientists have been aware of perovskites for decades, it wasn’t until 2009 that scientists actually applied the idea to solar. Perovskite is actually a mineral discovered in the 1800s in Russia’s Ural Mountains. You’d naturally think, then, that perovskite solar cells are made of perovskite, but you’d actually be wrong! Perovskite solar cells have what’s known as a “perovskite structure”. 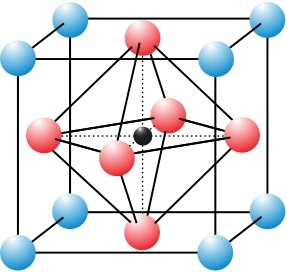 The mineral perovskite is made up of calcium, titanium, and oxygen (CaTiO3) and anything that follows this pattern (ABC3) is said to have a perovskite structure. So do perovskite solar cells have calcium, titanium, and oxygen? No way! They use completely different materials but in the same pattern (the materials used are complex to say the least. If you want to learn more, check out the link above). It’s this pattern, illustrated above, and the ensuing crystal-like structure of the atoms that this pattern forms, that gives perovskite structures their exciting abilities. Depending on the materials used, the compound can do some fascinating things, including the one we’re interested in: light absorption and superconductivity (meaning it can easily transport electrical charges). Once the perovskite solar cell material is created, it can be applied to glass or bendable thin-film just like other solar materials (silicon or CIGS, for example). Had enough science? Well, you’ve at least now got a small understanding of how perovskite solar cells work. Let’s move on to why perovskite cells are so exciting! Perovskite cells are super-exciting because they meet our three goals above: low cost, high efficiency, and greater applicability. First off, they are naturally cheap and easy to produce. With our common crystalline silicon solar panels today, the silicon needs to be ultra-pure to be of any use. The ‘scrubbing’ process to burn off impurities is expensive and both requires and produces extremely hazardous waste. Perovskite, on the other hand, doesn’t need any of these dangerous chemicals and can function even with impurities. The efficiency of perovskite is also very promising. Currently, our most efficient multi-crystalline silicon panels hover at 21.2% efficient – not too bad at all. But as of July 2017, South Korea’s Ulsan National Institute of Science and Technology has developed the most efficient perovskite cells in the world at 22.1% efficient – almost a full percentage higher than silicon panels! 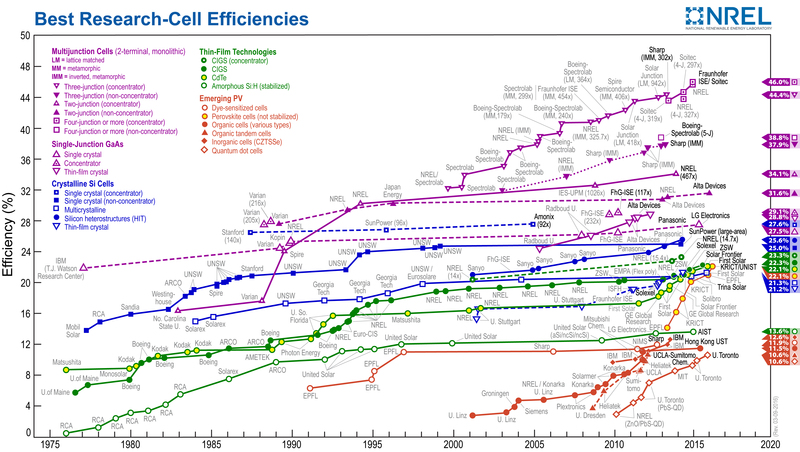 So already, perovskite cells are more efficient than our common silicon panels. And it didn’t take us 60 years to get here like it did with silicon panels (first introduced in the mid 1950s)! We achieved this huge jump in efficiency in just 8 years – think about where we could be in the near future. But wait, there’s even more to the story. Different materials have their own natural limit on efficiency, with some able to convert more sunlight than others. Multi-crystalline silicon, used in most rooftop solar, is fairly low on the scale, capping at about 60% efficiency. CIGS is just above that with about 63%. Perovskite cells, on the other hand, could potentially see efficiency around 72% – much higher than what most people have on their roof. Perovskite solar cells also meet our last goal: easy and/or varied application. Today’s solar panels are heavy, bulky, and require quite a bit of hands-on labor to install. Finding a solar panel that is easier to install or can be installed in novel ways will decrease installation time and lower costs. As we already mentioned, perovskite is simply a material that conducts electricity and harnesses sunlight, just like any other material. However, unlike our typical crystalline silicon, it can be printed onto glass or thin film materials, or even applied to organic photovoltaics. With perovskite, we can make ‘traditional’ solar panels, flexible panels, and even building-integrated solar! Pretty incredible, right? There’s a reason everyone in the solar industry thinks perovskite is the next big thing! This wouldn’t be a complete perovskite solar cell review if we didn’t talk about shortcomings. It is an incredibly promising technology, but there are still unknowns, mostly around the longevity of the cells. In the lab, perovskite cells can see decent longevity. When moisture is introduced, however, they quickly begin to degrade. 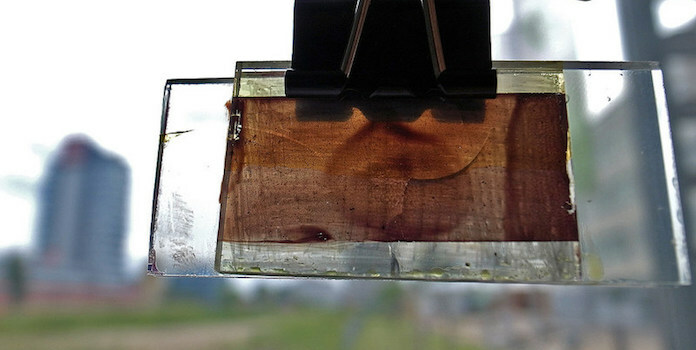 Once installed outdoors, perovskite cells currently last only a few months. Compare this to our standard roof-top solar panels that come with 25-year warranties and are estimated to last up to 40 years! And while moisture is the most serious culprit, it isn’t the only issue. Weather changes, extreme light, and temperature fluctuations all contribute to the cell’s rapid decomposition. Researchers are actively working to solve these problems, with a Swiss research team producing a low-cost 11.2% efficient perovskite cell that lasted a full year without any drop in efficiency. However, much more research is needed to lengthen that lifespan. While perovskite is more efficient and cheaper than traditional crystalline silicon solar panels, they’re simply not a viable option if you need to replace them yearly. In the end, perovskite solar cells are an exciting new technology that ticks all our necessary boxes: low cost, high efficiency, greater applicability. However, it’s still in its nascent stage and needs drastic upgrades in durability and longevity. Once researchers have cleared this path, though, perovskite cells could be the tipping point from solar as an outsider technology to one that’s installed on every home in the neighborhood!